The value of such rich soil at the center of the city ultimately attracted far-sighted planners, and the area was zoned to exclude industrial and residential development. A non-profit Intervale Center now manages much of the land, having restored 350 of the original 700 acres by leasing them for private farms, or running programs such as a conservation nursery, a food hub, and a farm incubator on them. The Food Hub was established in 2007 with the mission of advancing the local food system by creating different business models to get more local farm food to the public. 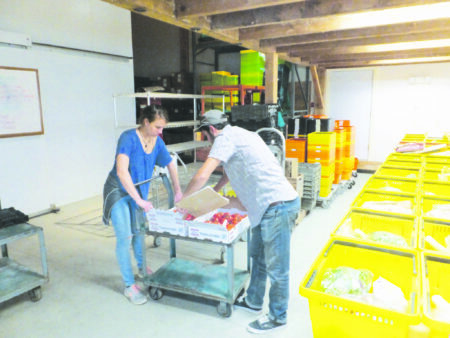 The hub is a for-profit business under the umbrella of a non-profit, the Intervale Center, that buys product from local farmers, combines it, and sells it wholesale to local stores and restaurants. But they also combine it into baskets designed for weekly family consumption. Tomatoes are taken from farmer boxes and distributed into food baskets. The hub has four full time, year round employees, plus some interns and volunteers. The staff all share driving. Because the Intervale has been designated a historic site, there are some limitations on construction there. An old dairy barn was at the location where the hub is, but was taken down. The hub structure had to use the same footprint and frame as the dairy barn, however, so it is not ideally designed for a food hub. The loading dock and a few other things would be a little different were it not a historical building, but it was important for them, as part of the Intervale Center, to made it work. What they developed to expand farm sales was a way to aggregate the product of various farms and make it available to buyers in a way which a traditional CSA can’t. About 75% of the vendors Bobby buys from are farmers, the rest being area food businesses which make processed products like bread or bean products. So far he has prioritized smaller farmers as suppliers. Each year in February and March Bobby will spend about 40 hours of crop planning time with the farmers. Based around certain recipes and meals the hub would like to feature, Bobby will work with the farmers and tell them what he needs, and when — say a certain amount of broccoli the last week in September. Some of the farmers would grow for that goal. As the season develops things may change, so he stays in touch and is ready to adapt if he has to. The plan versus the actual is often quite different. But for the most part what he is looking for in his projections of product and volume work out. If he finds someone with a product he likes and they can only produce part of what the hub needs of that product in a week, he will still give them an agreement for the partial purchase and try to find the rest elsewhere. “There are so many factors which come into play for purchasing,” he sighs. “There is availability of product — if something is behind schedule because of the weather and not ripening up, I have to scramble to hold slots open and move them around. But we sometimes have marketing and outreach connected to our plans, so I then can’t make substitutions and have to get the product from someone else if our farmer doesn’t have it. For most of our items I have backup growers I can go to, which wasn’t true five years ago. We are seeing a lot more supply, a lot more season extension. The hub also surveys their farmers regularly. One of their strong findings is that the farmers really enjoy meeting with others once a year in the spring to finalize the cropping plan. Currently the hub offers several different weekly food packages. Each has a normal price, and a single size price which is smaller and $5 less that the normal one. The packages are available year round, but you sign up for a period. Spring is 12 weekly deliveries, Summer provides 21 weekly deliveries, and Fall/Winter provides 17 weekly deliveries (November through February). Or you can sign up for the College period of 26 weekly deliveries (early September through April). In addition to these packages, you can also sign up for monthly deliveries of chicken, ground beef, sausage, bean burgers, tortillas and beans, wild salmon and white fish. Kendall Frost and Melissa Cattalargo help Bobby load truck. According to Kendall Frost, marketing manager of the hub, Vermont Bean Crafters is an example of a processor that does a really good job and which the hub has helped succeed. They make bean burgers, falafel and many other bean products. Maple Wind Farm is the primary source for their beef, pork and chicken. Most of their meat is not organic but is pasture-raised non-GMO. Similar to a standard CSA, everybody gets the same thing. On the week I visited in September the share included potatoes, carrots, beets, leeks, peppers, broc-coli, and mesclun for the produce part. For protein for the Omnivore share it included sausage made by Maple Wind Farm and a vegetable broth made at Joe’s Screamin’ Ridge kitchen. Bobby is proud of the help the hub has given to start-up farmers. Being year round, the hub has encouraged the growth of storage crops for the winter and the season extension. The guy who grows their sweet potatoes, for instance, was starting fresh and the hub was one of his first accounts. Hub staff have developed a coordinated system for aggregating and delivering product each week. Each day different baskets are laid out on tables at the hub facility. 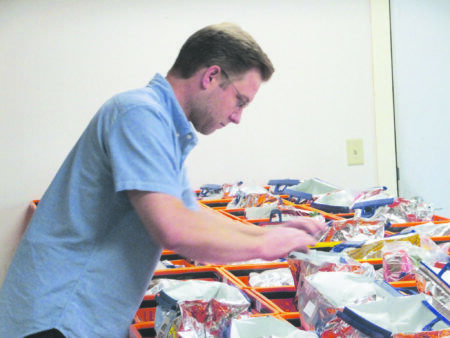 The hub delivers to about two dozen locations each week and the baskets destined for a particular delivery location will be grouped together. The particular package and extra items a basket is to deliver is marked on the basket’s sticker. The staff then bring out the items each vendor has supplied and they are passed out into the baskets according to the sticker’s markings. 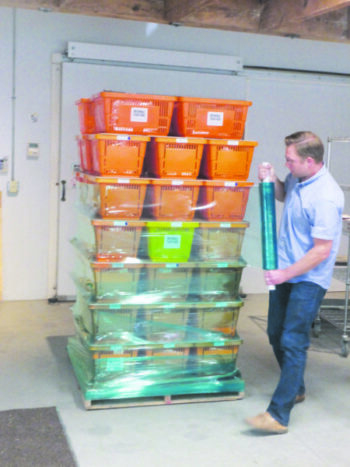 When the aggregation is finished and each basket is full, the table with the baskets for a certain delivery location (the tables are on wheels) can be rolled over to the loading dock door and the baskets then stacked in the back of the hub’s refrigerated truck by location, last off first on. The staff make good use of their one truck, making 8 to 12 site deliveries a day during the week. Altogether in a week about 400 different individual baskets will be delivered, plus the wholesale sales. On Mondays and Wednesdays hub staff make wholesale deliveries to the University of Vermont dining service, Sodexo. 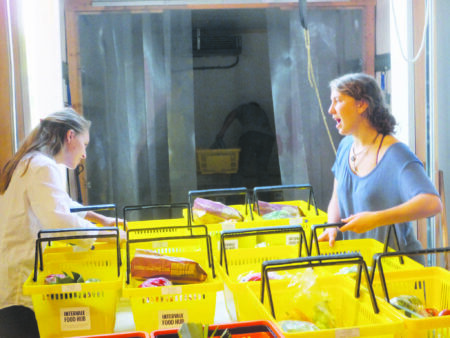 On Tuesdays they deliver individual orders in baskets to UVM and St. Michael’s College for the college students, and then that truck will go on to do more workplace or public deliveries. Wednesdays people come to the hub to pick up and the truck will come back from delivering wholesale to Sodexo and get loaded up to do workplace or public site deliveries of individual orders. On Thursdays it is more public or workplace deliveries. The economics of Intervale’s Food Hub are interesting. They purchase about $325,000 to $330,000 worth of product per year, with the majority of that being produce. The smallest farmer they deal with might sell them one to two thousand dollars annually, while the biggest account might sell $40,000. Prices paid to farmers are pretty comparable to what other buyers pay. Some items are high value, others not. Some change their price as the season proceeds. When the hub sets a share price they have to fix an average since the contents of the basket vary somewhat over the seasons. They try to keep it at what a consumer would pay in a coop or store for the same items. But in order to give a fair price to the farmers the hub negotiates a price with most of them which is somewhat above what they would get in traditional wholesale. Determining the quantity of food in a basket is also complicated. Surveys show that the majority of hub members are two-person households. When Bobby analyzes the servings per basket the benchmark is to have a dollar per serving of a vegetable. The Vermont Vegetable Package has 2 sizes, one averages $25 per week, the other $30 per week. And 25 to 30 servings of vegetables is the USDA recommendation for one active adult. So from there, if you are cooking a lot for yourself, one person could eat this much food. Of course staff know people don’t cook every meal at home, they like to eat out, sometimes they don’t have a serving of vegetables with every meal. So splitting it between 2 people is really manageable. The hub is mostly looking at 25 to 35 or 40 year olds as members, young professionals, mostly couples, sometimes young families. They also reach a pretty wide range of socio-economic levels and membership is pretty reflective of Burlington – people of different backgrounds and incomes still value healthy local food. Because the hub is not a farm, they are not exempt from the Food Safety Modernization Act (FSMA). As a facility they need a hazard analysis plan. The nice thing is, though, that since they had to write up one for Sodexo, they are over and above what they need for FSMA. “Most of our farms are below the FSMA threshold,” says Bobby, “none that I know of are doing half a million dollars or more or are doing full wholesale. But we are considered like a restaurant or grocery store, so we have to comply. We have a very informal agreement with our farms – a checklist which we ask them to sign and send back to us every year and they have to have proof of one million dollar product liability insurance. We also have a manual that tells them how to deliver and what our standards are. It shows how we do business with farmers. They agree to the updated manual, as well. Down the line the conditions may get tougher, of course. Several questions trouble staff when trying to make decisions about the hub and its activities. “We market promoting Vermont product,” says Kendall, “but sometimes we just can’t find what we need in state, so we go elsewhere. That is one of our questions in our business development – is it more important to purchase from local but not certified organic growers, or should we go to a certified grower in Quebec if a local grower isn’t organic? So we have to think carefully about what is local. The growers in Quebec, for instance, are just as close to us as those in Shoreham. Another question the hub is facing is whether to move more in the direction of prepared foods and meal kits as is now being offered by Blue Apron and many other companies. One of the most interesting developments at the hub this year is the response of subscribers to direct home delivery. After several years of rapid growth, food hub sales in 2014 reached a plateau. The hub now actually has a house-to-house delivery route in the near north end of Burlington. What was interesting with this progression into home delivery was finding that the single person size was too much food for a single person, and that families don’t need as much variety but can use more volume. Another astonishing fact was that they didn’t need to charge extra for the home delivery service! About 50 baskets are currently direct delivered to near north end homes. They are stacked and shrink wrapped so they can be rolled into the cooler to wait until the truck returns from other deliveries for this late afternoon trip. The home delivery program has been so successful that the hub is now offering it throughout Burlington. Delivery is scheduled to start the week of October 30.